I have been wondering if the number of keys a person needs to carry about is some kind of indication of the complexity of their life. 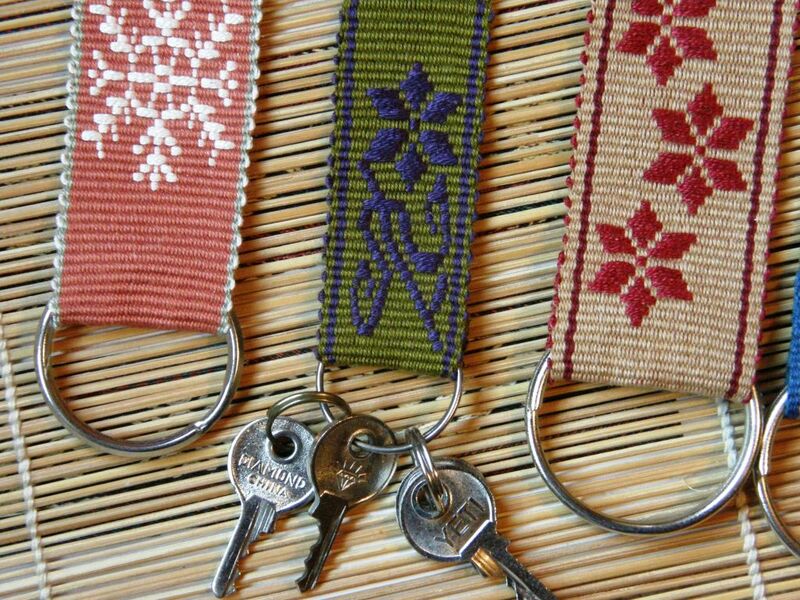 After making lots of key fobs in the Ravelry Backstrap Weaving Group’s Weave-Along, I realised that I only have one key! That’s the key to my front door and I have a spare hanging in the kitchen. I don’t have a car, so there’s no key for that. And yes, life does become a bit more complex when I am on the road teaching. Then I carry eight little TSA padlock keys for my two big pieces of luggage and it is a nightmare keeping them in order. Plus there’s a spare set, so I have sixteen keys in all. 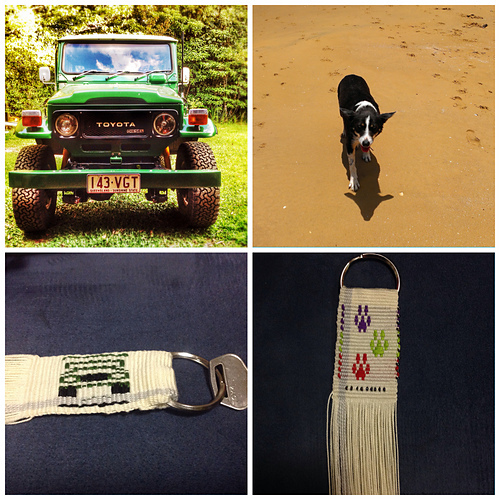 So, why make all these key fobs?….well, it’s just plain fun. On top of that, as I mentioned last week, it gives me a chance to sample a new motif, new-to-me yarn and color combinations. 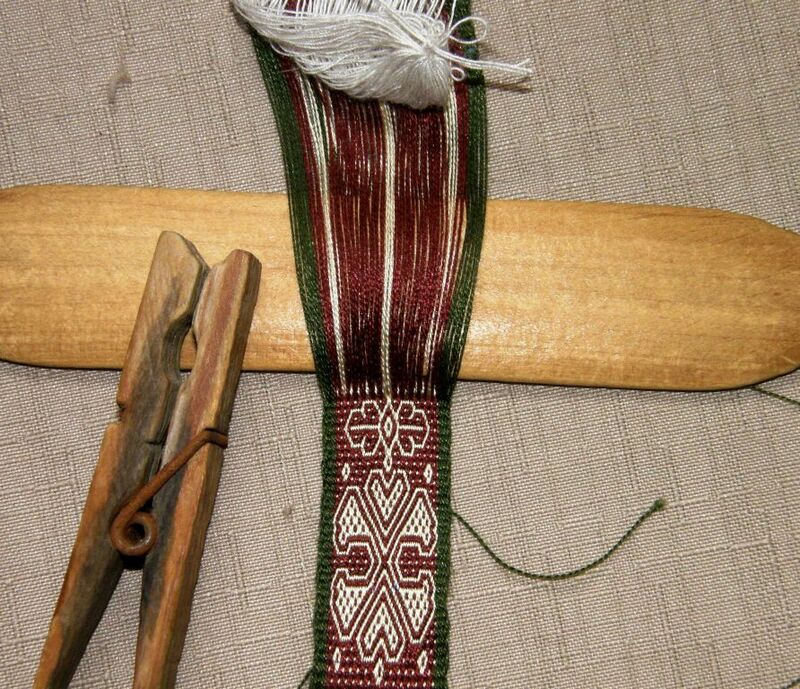 And for people who are new to backstrap weaving, it is a chance to learn new techniques. 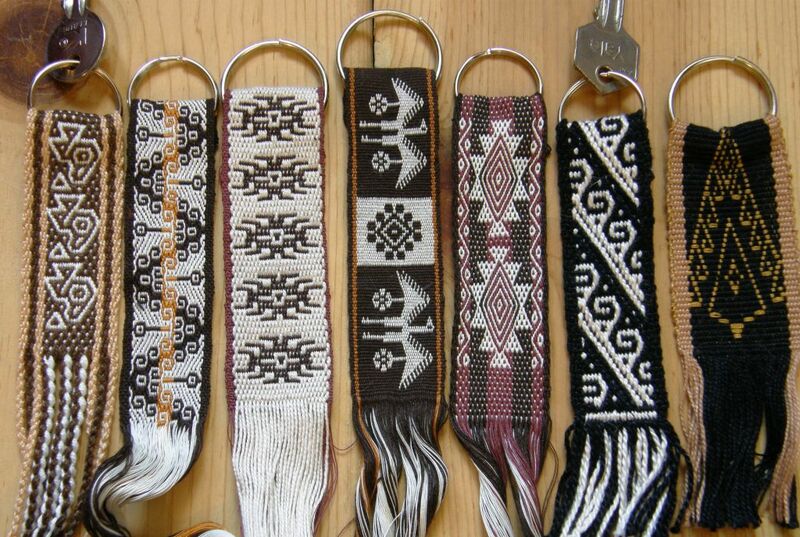 Some of these key fobs will be gifts and some will remain with me as samples for weavers. One or two might actually be used for my keys. 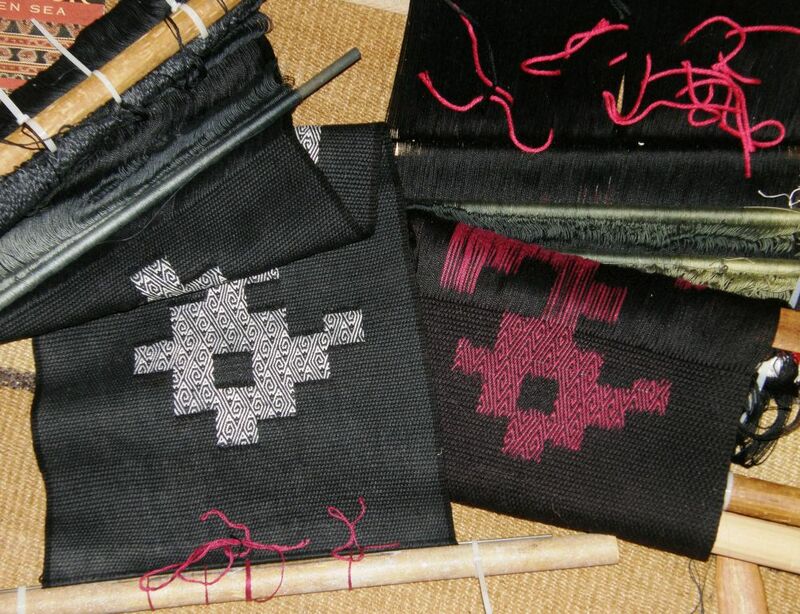 But, I think that they will mostly serve as guides when I come to use these motifs and yarn in bigger projects. This week I made some new samples and also worked on finishing some of the bands from last week. I tried my leaf pattern in warp-faced double weave and enjoyed the very robust look of the motif in that structure. 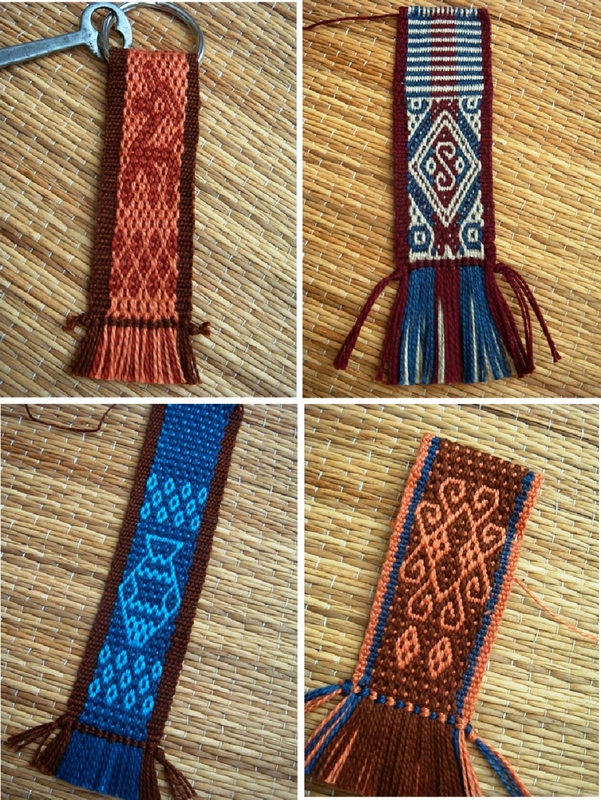 I also received a nice message on my blog on how to extend the instructions for the five-strand flat braid to a nine-strand version and I used that on the beige band above left. It makes a tighter, more practical barid for this kind of thing and I love it. I made the dark brown wool fob you see above and used the five-strand flat braid for that one. I was surprised to find how slippery the wool was with the silk supplemental weft and there are definitely things I would do differently next time when using that combination of fibers. 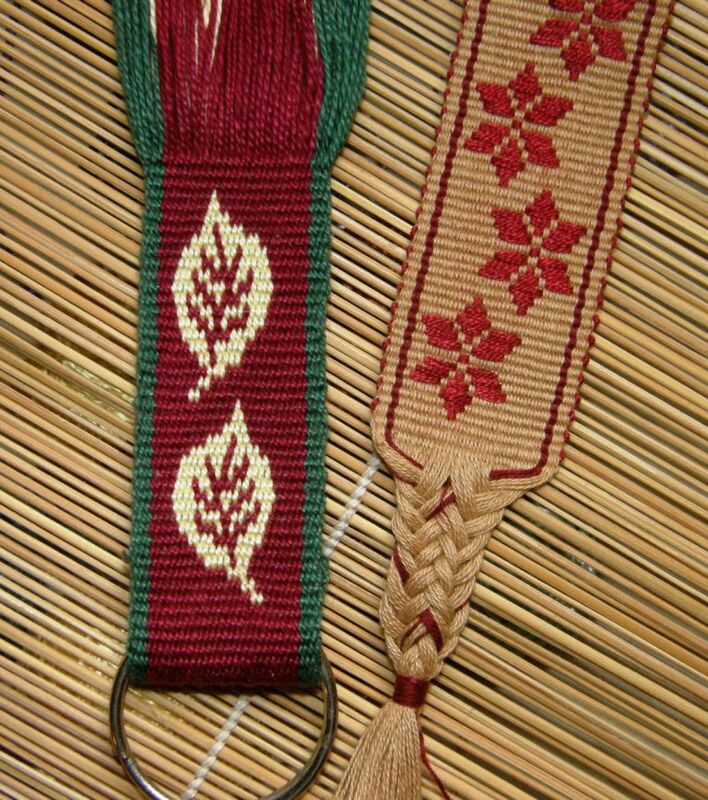 I didn’t like the thin and spindly look of the four-strand round braids on the green fob and so I gathered and bound them together. The snowflake fob has a finish that was taught to me by my weaving friend, Chris. It is the first time I have tried it and I think it needs a bit more practice. Right now I am working with 60/2 silk. This is something that I have been wanting to do for a long long time…ever since I bought the little tubes of left-over silk when I was with Sue in England in 2012. I have been happily using it as gorgeous supplemental weft in a lot of different projects, like the pouch at left, but what I really want to do is weave using it as warp. ….and found it very hard to handle the fine strands of silk that wanted to stick to and snag on any imperfections in the skin of my fingers. 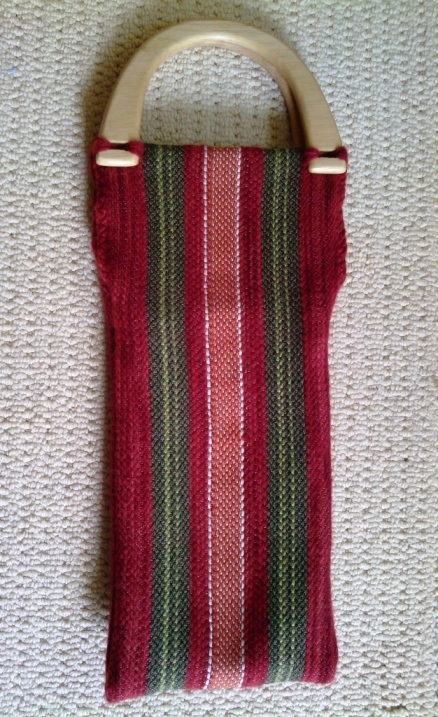 I did manage to use it in a warp-faced double weave piece I was made for my nephew…. But I really want to use it for Andean Pebble Weave. 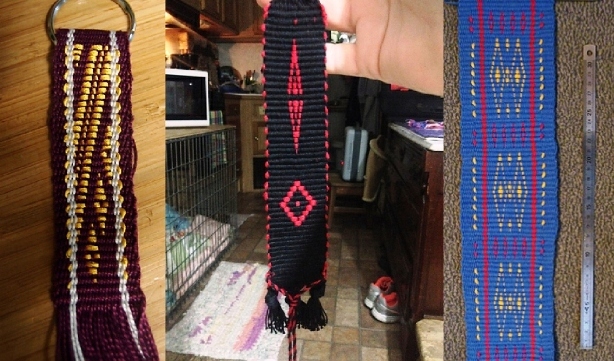 But now that I am actually weaving it, I don’t think I will stop at key fob size. I will weave off the entire warp as I really want to get confident with this and use the silk for larger projects. You will notice I chose black…the hardest color to see. I figure if I can manage it in black, I will be able to manage it in any other color! I am just getting a handle on width and tension, for now. The silk feels so good! The silk project and the big bird project have been keeping me busy. Plus, February 1st was the date I set to start my workshop prep. I have three distinct work stations set-up in the wee apartment now. The kitchen counter is Key Fob Land, the bedroom floor is Birdsville and the living room floor with warp hooked to the tv cabinet is Warping and set-up Mayhem Zone. I did slow down a bit yesterday and today as I am suddenly one tooth less wise and will be probably be without another wisdom tooth after a visit to the dentist later today. That has made me feel a bit wonky. Let me show you what other folks have been up to. In Australia, Susan has been making key fobs although she doesn’t do the online group thing that much. She sent me a picture of her progress so far and it is a nice sampling of different techniques…. 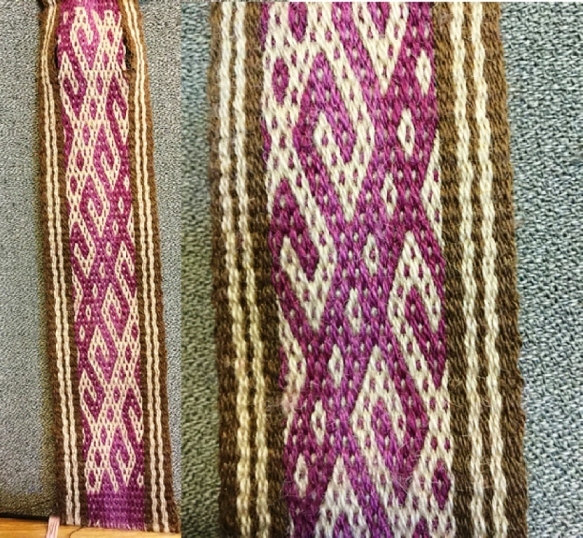 From left to right….Bedouin warp-subtitution technique, a threaded-in pattern, simple warp floats and Andean Pebble Weave. 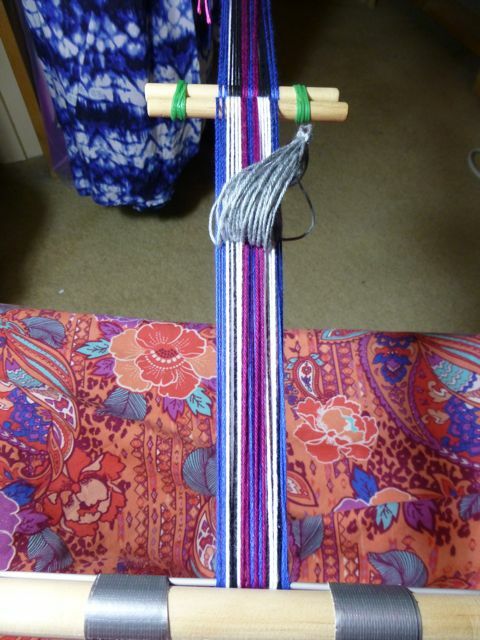 Wendy, over in Perth, Australia has joined us and showed us her warp and set-up. She has also been visiting the local yarn and craft stores and giving me good information about the different kinds of backstrap-friendly yarn she has been discovering in Australia. 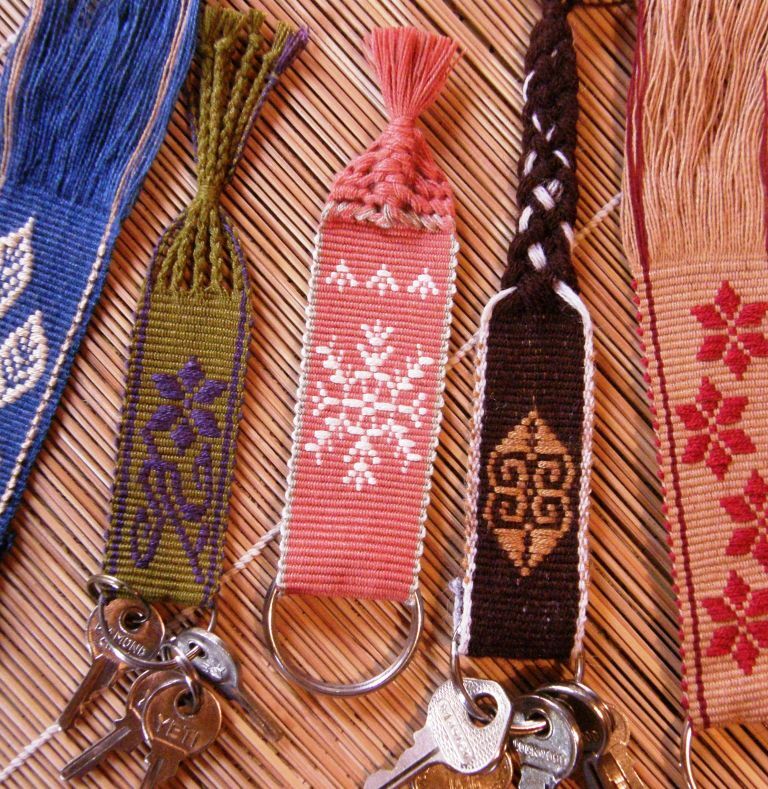 Our ”other” Julia has been working up several of the small motifs in my second book in Andean Pebble Weave and other complementary-warp structures and has a lovely collection of key fobs in 5/2 perle cotton each with its neat weft-twined finish…. 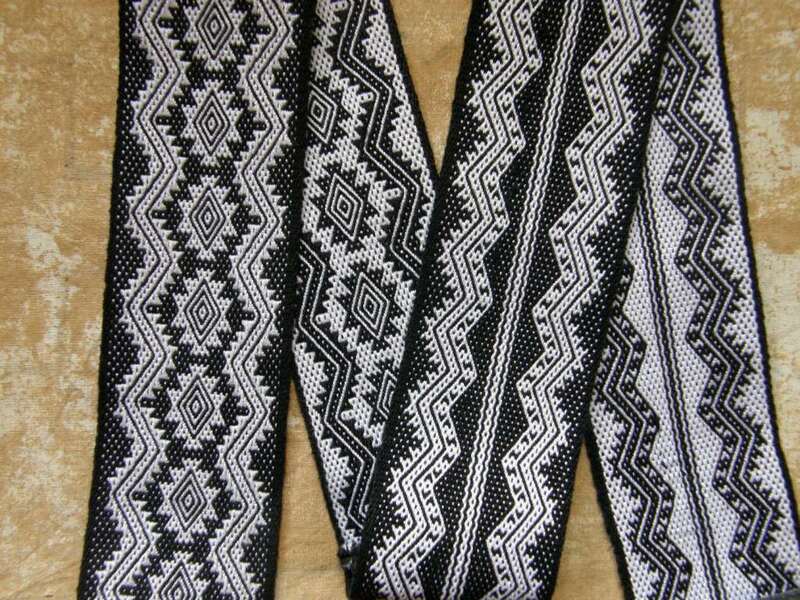 It’s nice to see people trying patterning with supplementary-weft (below) and I hope we see more of it. 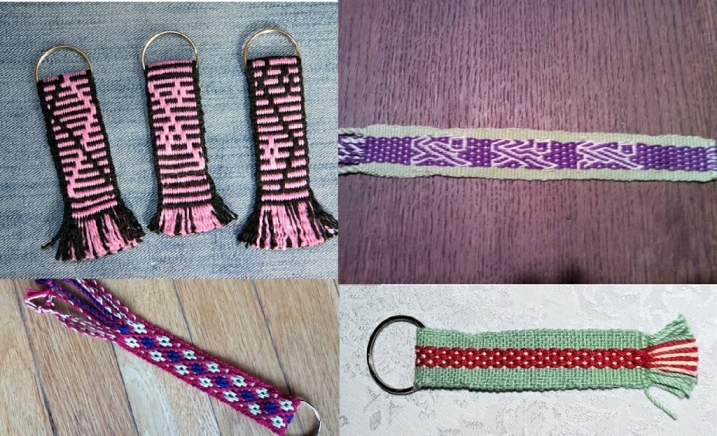 Julia T made a key fob with her own design, Marsha is weaving a cuff on a vertical loom and Valtricot created her own design for a cellphone pouch. Each weaver shows a different way of handling the turns of the supplemental weft and I think that is really cool. It is normal for the patterning to come out a bit disjointed the first time around. Samples need to be woven to be able to figure out just how many strands of supplemental weft material will suit a certain weight of ground warp thread. It’s all a bit of guess-work at first. On top of that, you are counting threads and learning to create the pattern spaces and handle the extra weft etc. Quite often the need to adjust the way you are beating is not immediately apparent. 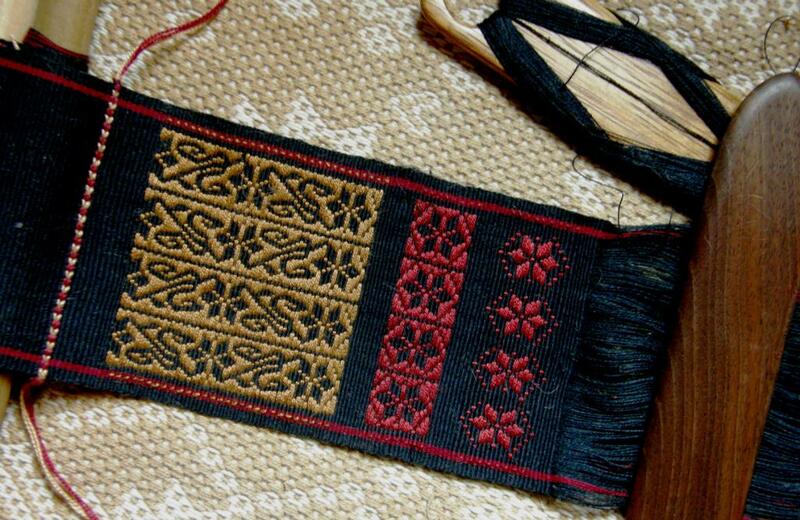 The designs always look nicer if there is connection between the rows of weft. The motifs will look more like solid shapes that way. Knowing how your charted pattern will look when woven is another thing to consider. Sometimes the dimensions of the cells on the chart will not perfectly match your picks per inch/ends per inch ratio. And that’s the idea of this WAL…the opportunity to make tiny samples and figure all this out. Betsy, who is away from home right now, is still determined to join us in our WAL and has come up with a clever way to wind her warp in her temporary home. She is using her own handspun as well as crochet cotton for her projects. She has come up with some nice patterns using only four ends of each color. Eska made three fobs using the simple warp-float technique experimenting with floating just one and then two colors. JoAnne designed her own clever Andean Pebble Weave cats. Linda floated both colors in the simple warp-float technique to create this yurt band border pattern and knitnfrenzy reminded me just how striking ‘plain’ Andean Pebble Weave, that is, the basic structure without a motif, can look. We had some talk about cuffs. Janet mentioned her intention to weave some and I remembered having seen some in a Peruvian Connections catalog when I was in the US last fall. It seems that quite a few of us are not into jewelry but would consider wearing a hand woven cuff. Janet got to work with her naturally dyed handspun and showed us her work, complete with button holes…. This pattern is charted in my second book. 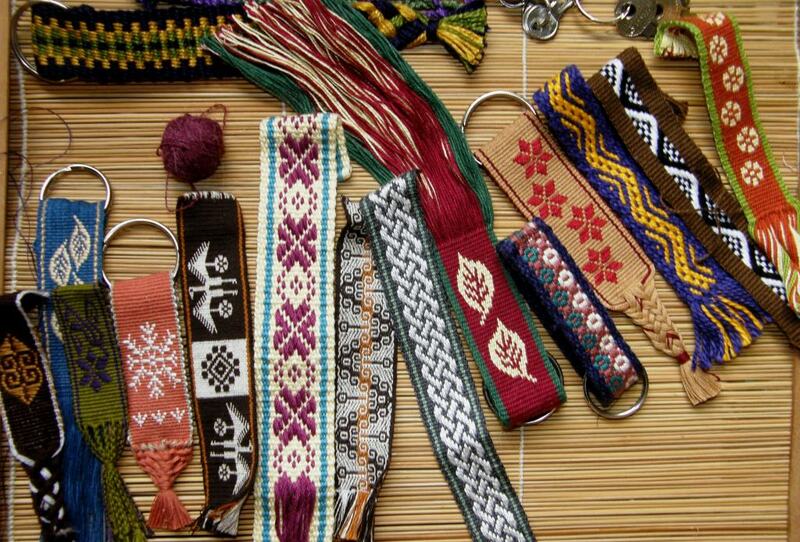 I have been scratching around in the closet jumble and getting out some of the sample bands that I have woven all of which would be suitable for key fobs. And there are many many more. I know that I have a bunch of Bedouin-design bands somewhere and then there is a myriad of bands that I wove as samples for the second book. Although I like the look of this colorful jumble of bands, and could make plenty of fobs, that’s not the point of the WAL…the idea is to try something NEW. 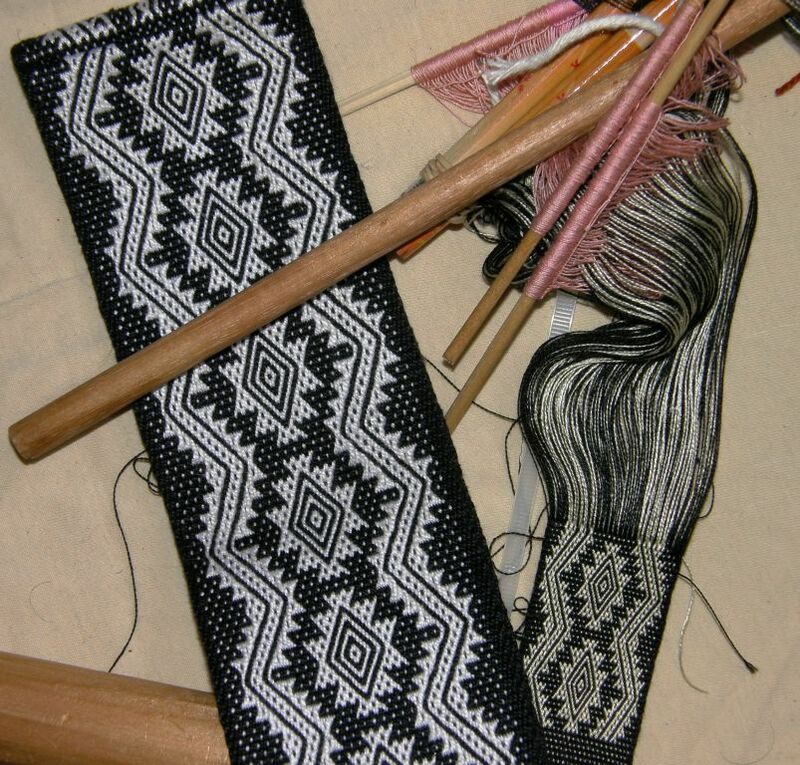 So, for now, I will continue with my silk band and dream about the day when I can weave a large, fine, silk wall hanging on my backstrap loom with lots of pick-up patterning. 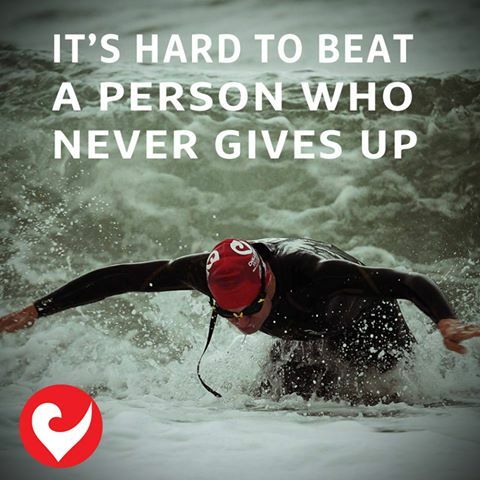 I will leave you with this Challenge Family Triathlon motivational poster which was put together after last Sunday’s Challenge race in Melbourne, Australia in which my nephew took part along with over 1200 other athletes. It was a nasty day with big seas, wild winds and cold. I followed it on Saturday afternoon in Bolivia all the while horrified by the poor weather conditions. That’s my nephew, Ryan, in the poster! 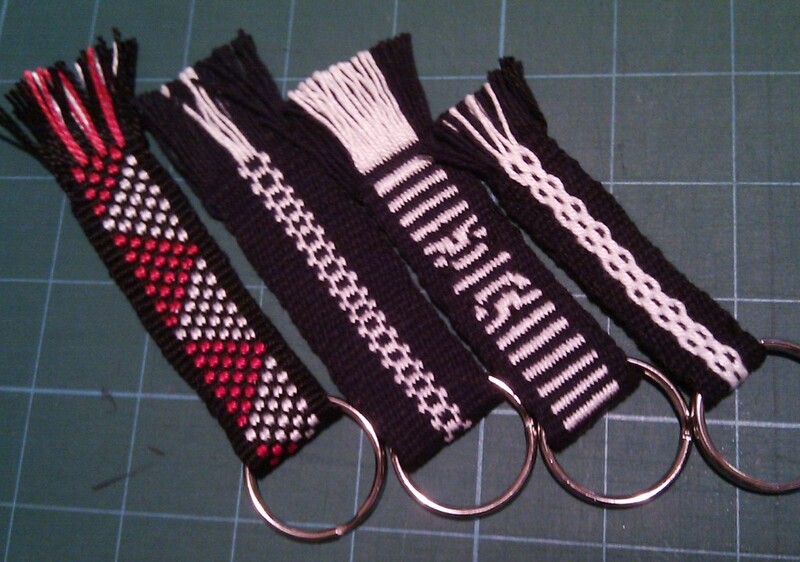 Have amost finished some key fobs. Will post some pictures soon. 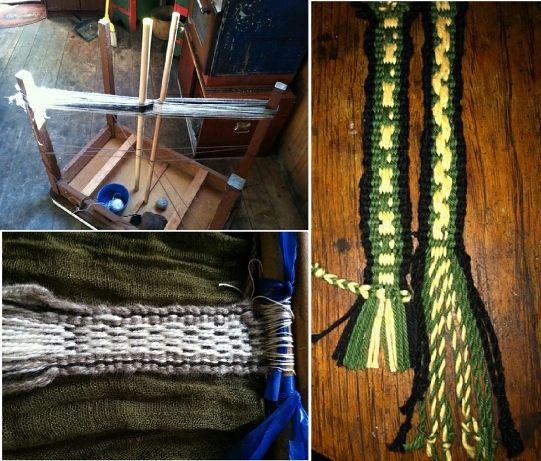 It has been a good experience re-remembering how to warp up for all the different weaving styles. Great idea, the WAL. As for those saggy fingers when using silk. I always keep a jar of sesame seeds soaking in water. When my hands are rough, I use the water like lotion and it seems to smooth those rough spots out making it easier to use the silk especially when spinning it, but also when weaving. I hear your pain with the silk snagging on fingers. I’ve seen Bhutanese weavers keep a piece of super-fine sandpaper on hand & have used that strategy myself (It works!). Just took photos this morning of all my finished bands. Will get them onto Ravelry before the end of the weekend I hope! Love love LOVE the silk. A trick spinners use is to scrub your hands with a mixture of lemon juice and sugar before spinning silk – it tends to scrub off the snaggy bits. I am so jelous of everyone’s keyfobs!! I have some DMC thread I was thiking of using for this and then life happened, I think I need to disapear for a few hours from the family and just work on this!